CHARLOTTE, N.C., Oct. 22, 2018 /Christian Newswire/ -- Billy Graham: An Extraordinary Journey -- a film commemorating the life and impact of world-renowned evangelist Billy Graham -- will come to DVD and digital HD beginning Nov. 6. "It's an extraordinary journey," said Franklin Graham, president and CEO of the Billy Graham Evangelistic Association. "How God took a young boy off a farm in rural North Carolina in the South and then from there to the ends of the earth. God used one man to touch the world like it's never been touched before -- Billy Graham was just part of that journey." The 72-minute film offers a unique look into the life of the minister, who passed away in February 2018. The documentary details Graham's journey as a dairy farmer's son who rose to prominence, becoming one of the most important religious leaders in modern history. 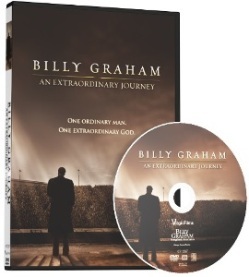 The DVD contains hours of bonus footage and features, including Billy Graham's funeral. The Billy Graham Evangelistic Association is a nonprofit organization that directs a range of domestic and international ministries. From its headquarters in Charlotte, N.C., the Billy Graham Evangelistic Association directs a wide range of domestic and international ministries, including: large-scale festivals led by evangelists Franklin Graham and Will Graham; The Billy Graham Library; The Billy Graham Training Center at The Cove, located outside of Asheville, N.C.; SearchforJesus.net, an Internet evangelism project reaching thousands of people for Christ online; and many others through print, television, telephone, radio and the Internet. For more information, please visit BillyGraham.org. Get news updates on Twitter at Twitter.com/BGEAnews.